Nash Country Kick Off with Brothers Osborne On Sale 3/9 10 AM CT! Kick off the biggest week in Music City with Brothers Osborne & NASH FM 103.3! 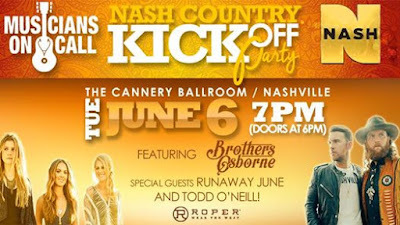 The NASH Country Kick Off Party with Brothers Osborne and special guests Runaway June and the NASH Next 2016 Winner Todd O’Neill! Enjoy a great night of music for a great cause! Tickets: $35 (proceeds benefit Musicians On Call) Available here Thursday 3/9 at 10am!